We have been running over the due time for the View's 30,000 mile oil change. The job needs to be done at a dealer. We got lucky today and found a Dodge Sprinter dealer in Moncton, NB that would do the job. We were in and out in a couple of hours, so we are still on schedule. The rest of the day was spent on the Trans Canada on a beautiful new 4 lane limited access highway. Like most interstates it is not very interesting. 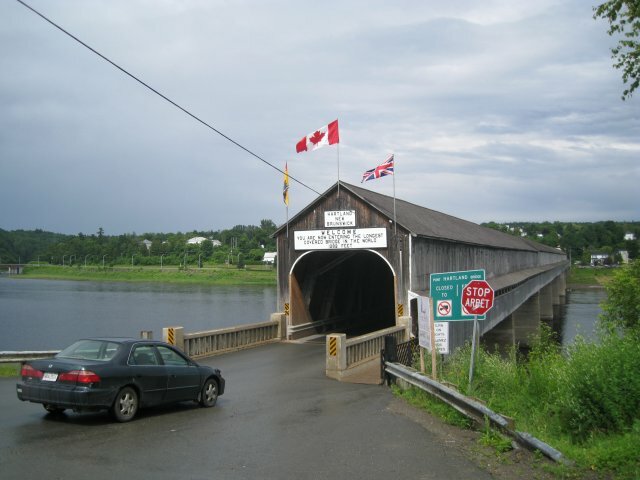 The highlight was a side trip to see the World's Longest Covered Bridge at Harford, NB. (see photo). We stopped briefly in Grand Falls. The main street is very wide and has a park running down the middle, something like Belle Meade Blvd in Nashville. There really is a large water fall and and impressive gorge.. Tonight we are in a very French campground called "Paradis de la P'tite Montagne" which I translate as Little Mountain Paradise. We are just a few miles from the Quebec border.